This OTAM Millennium 58 Open features a luxurious interior and open cockpit. The aggressive yet obedient design insures you will not blend in with other vessels. On deck is a large, open cockpit with lounge seating and a spacious sun deck. Proving that style, luxury, and performance are of most importance. Below deck is an open salon that can be custom designed to meet the desires of any buyer. Lavish accommodations, full galley, and luxurious salon seating provide a break from the sun with room to entertain or unwind. You have your choice of MTU or Caterpillar engines up to 1622 horsepower. ASD 14 L surface drives convert all that power into performance with a top speed of 55 knots. The engine compartment is expertly insulated to provide a quiet and comfortable interior. The resulting design has provided OTAM with a yacht that has an incredibly smooth and responsive ride. 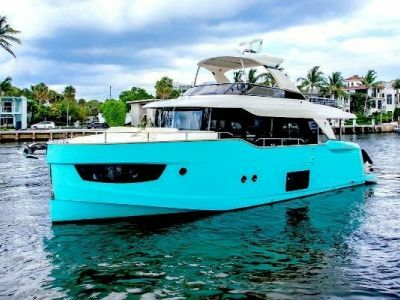 Vessels & Photos featured are examples of the fully custom OTAM yachts delivered to happy clients.